The fact that the classic manually wound Patek Philippe chronograph with horizontal clutch and column wheel control comes in three degrees of complexity reflects the manufacture’s heritage. Now, its proprietary chronograph caliber is being launched with a perpetual calendar and a split-seconds function, two of the most popular complications. 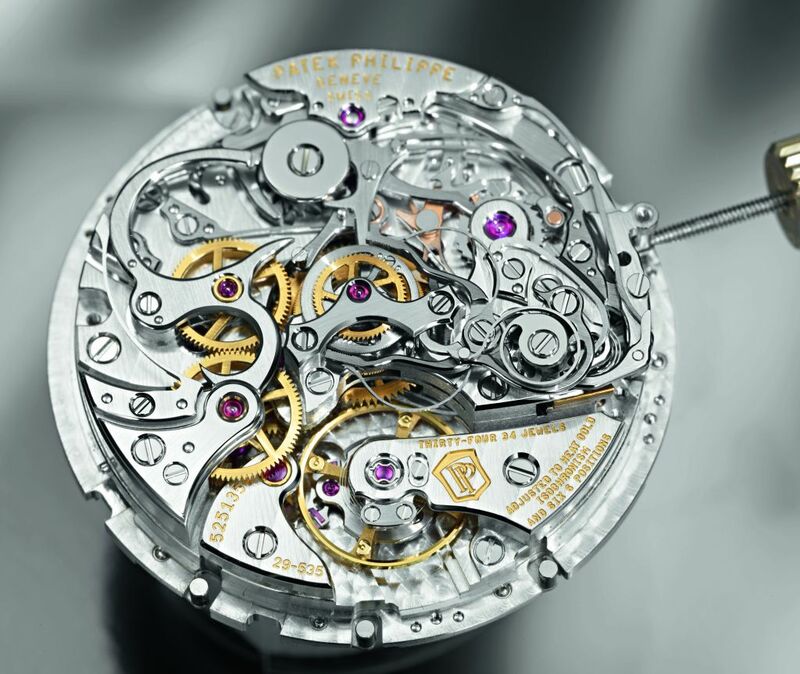 In this grand complication version, the caliber is designated CHR 29-535 PS Q. The perpetual calendar (Q) relies on the same configuration as the one first presented a year ago, integrated in the Ref. 5270 chronograph. 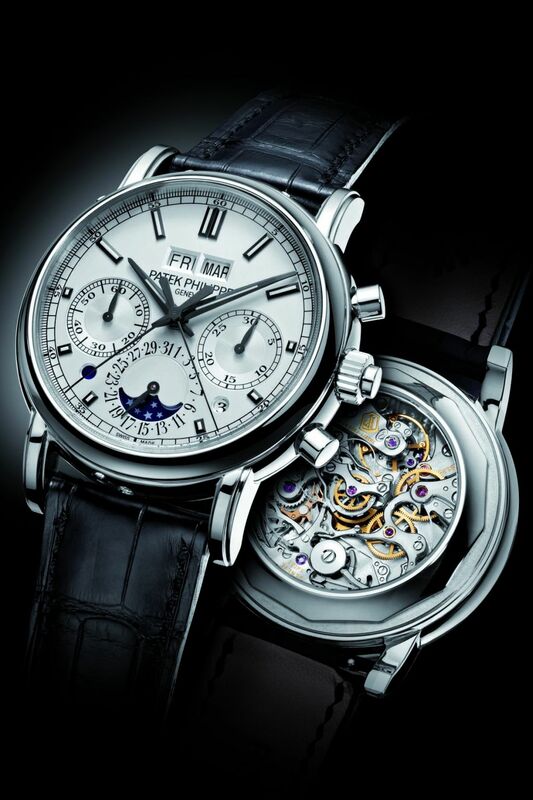 The split seconds chronograph (R), however, was extensively redesigned by Patek Philippe’s engineers. The innovative split-seconds isolator reduces the height of the movement and assures that the balance amplitude remains constant while lap-time readings are being taken. 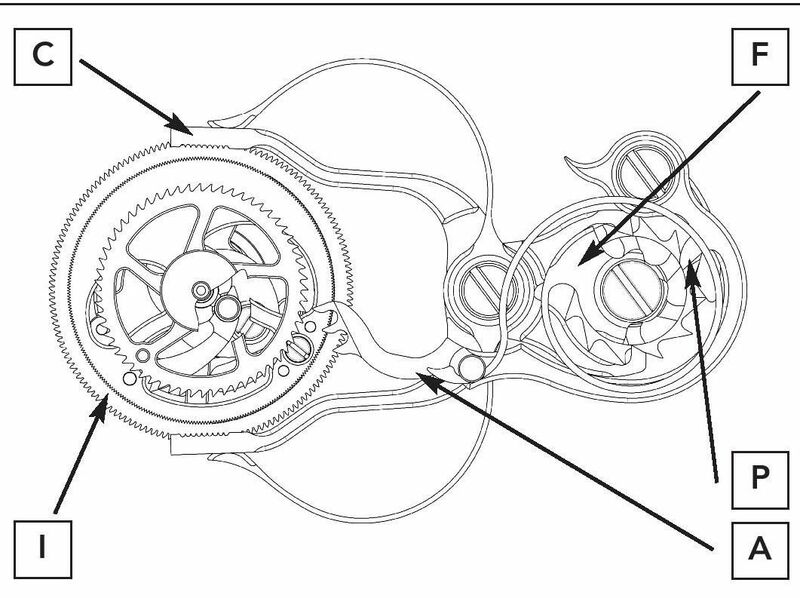 A patented equalization device constrains possible angular deviations between the chronograph and split-seconds wheels by 75%. The result: nearly perfect superposition of the two sweep hands. This micromechanical marvel is housed in a classic round platinum case with a diameter of 40 mm beneath a white opaline dial made of solid gold. The movement can be admired through the sapphire-crystal display back. Owners who are overwhelmed by so much beauty can have it replaced with the solid-platinum back provided with the watch. Traditionally, Patek Philippe’s classic chronographs can be assigned to one of three categories: simple chronographs, simple chronographs with perpetual calendars, and split-seconds chronographs with perpetual calendars. This tradition has been upheld with the CH 29-535 PS proprietary caliber that was launched in 2009 in a basic configuration that would later allow the addition of a calendar module and a split-seconds mechanism. The Ref. 5170 presented in 2010 and the Ref. 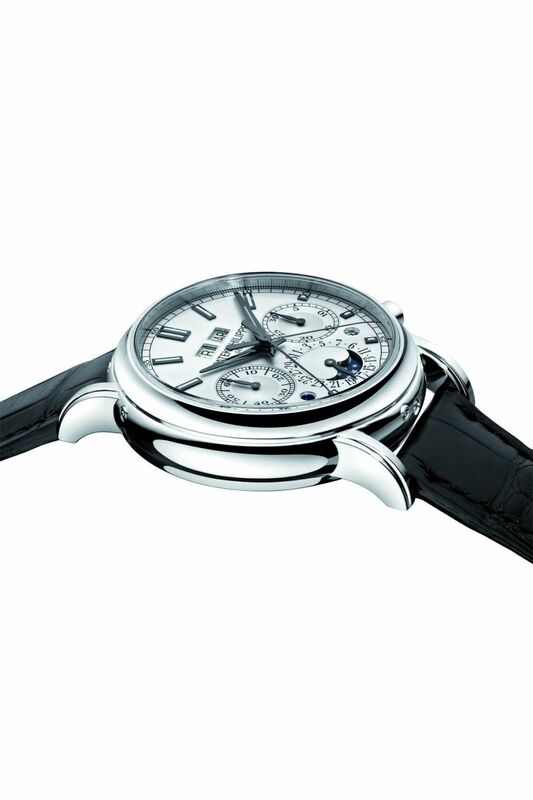 5270 introduced in 2011 are now joined by the new Patek Philippe split-seconds chronograph Ref. 5204 with an all-new caliber developed in-house: the CHR 29-535 PS Q. Two years ago, connoisseurs and collectors already began to speculate that Patek Philippe’s coveted Ref. 5004 split-seconds chronograph in a classic manually wound design with a column wheel and a horizontal clutch, as well as a perpetual calendar, would some day be superseded by a new split-seconds chronograph based on the manufacture’s proprietary CH 29-535 PS caliber. But even experts were surprised how quickly the suite of in-house chronograph versions was completed. The intention behind the annual flow was to present a complete line of chronograph models based on the new proprietary movement as soon as possible, an initiative that yet again demonstrates the competence of the independent, family-owned manufacture. The ambitious project has now been completed. For decades, Patek Philippe’s emphasis has been on crafting its movements in-house and endowing them with the manufacture’s inimitable signature. But for a long time, there was an exception to this rule: Until the CH 29-535 PS chronograph caliber was launched; Patek Philippe classic chronographs were powered by the 27-70 caliber. It was outsourced from Nouvelle Lémania but in a modified version built to the manufacture’s specifications and crafted exclusively for Patek Philippe. The caliber was always assembled and completed in Geneva, and in the opinion of many aficionados, it was the world’s best and most beautiful chronograph movement. This was the benchmark to be eclipsed in the new millennium with the launch of a unique chronograph initiative that subsequently culminated in 2005 with the development of the CHR 27-525 PS, the world’s thinnest, split-seconds chronograph; in 2006, with the self-winding CH 28-520 IRM QA 24H chronograph caliber with an Annual Calendar; and in 2009, with the manually wound, column-wheel-controlled CH 29-535 PS chronograph with a horizontal clutch. The mission was accomplished, as evidenced by the applause from every corner of the horological world. This paved the way for enriching the classic chronograph series with different degrees of complexity based on proprietary calibers. Together with the three Patek Philippe basic chronograph calibers and the chronograph module for the Triple Complication Ref. 5208, eight chronograph movements were launched in merely seven years. The new Patek Philippe split-seconds chronograph with perpetual calendar features all the traditional assets that impress true connoisseurs – manual winding, two column wheels, horizontal clutch – yet it is also the most modern representative of its category. This is due on the one hand to the CH 29-535 PS basic caliber whose six patented innovations are summarized in Annex 2, and on the other, to the perpetual calendar presented to the world in 2011 with the launch of the Ref. 5270. Accordingly, the new CHR 29-535 PS Q split-seconds chronograph caliber also beats at a frequency of 28,800 vps (4 Hz), features an instantaneous 30-minute counter and a continuous seconds subdial, and has a power reserve of 65 hours. But the split-seconds mechanism was totally reworked and updated with two technical innovations: an innovative isolator for the split-seconds lever and the patent-pending mechanism that optimizes the congruent alignment of the split-seconds hand and the chronograph hand. Isolator system in the Ref. 5004: The isolator for the split-seconds lever relies on an isolator wheel that is driven by an octopus wheel (O) (isolator wheel / splitseconds spring wheel) on the split-seconds column wheel and uncouples the split-seconds lever as soon as the split-seconds clamp (C) closes. Because the octopus wheel consistently rotates in the same direction, it always has to be returned to its home position together with the split-seconds lever; this is done by the isolator wheel spring as soon as the split-seconds clamp opens again. Disadvantages: The disadvantage of this design is the extra height needed by the isolator wheel spring that sits on the split-seconds wheel (I). Because the springs of the split-seconds lever and isolator wheel act in opposite directions, the isolator wheel spring must also overcome the force of the split-seconds lever spring to rotate the unidirectional isolator (octopus) wheel back to its home position. 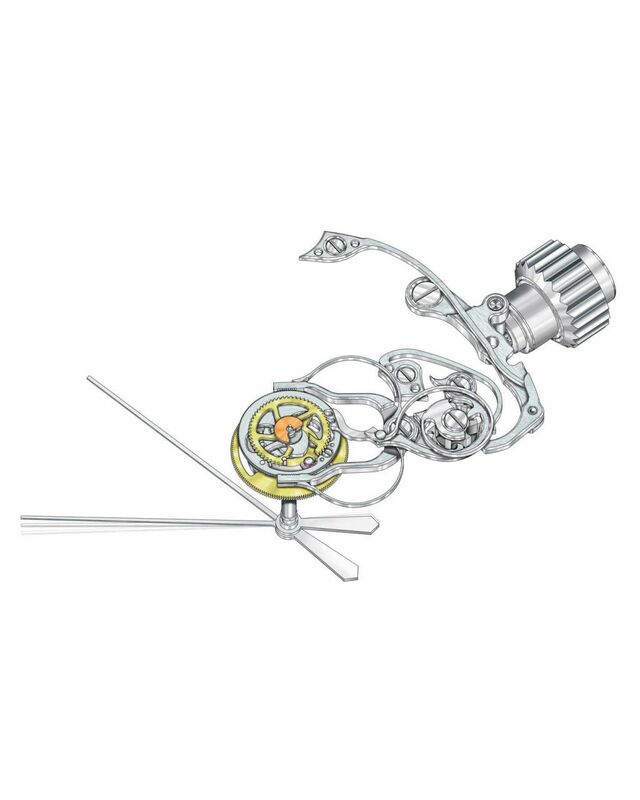 The unique Patek Philippe design is based on an isolator (A) controlled by the split-seconds column wheel (B). As soon as the split-seconds clamp (C) closes, the beak (P) of the isolator falls between two columns and with its teeth advances isolator wheel (D) that uncouples split-seconds lever (E). When the splitseconds clamp is opened again, the beak (P) of the isolator is lifted onto a column; its teeth turn the isolator wheel in the opposite direction and the split-seconds lever is released again. The swan’s neck cap of the column wheel doubles as a spring (F) that constantly presses the isolator (A) against the split-seconds column wheel. Advantages: The new design is thinner because it eliminates the need for an isolator wheel spring mounted on the split-seconds wheel (I). The isolator spring is part of the split-seconds column wheel cap. Unlike the mechanism in the Ref. 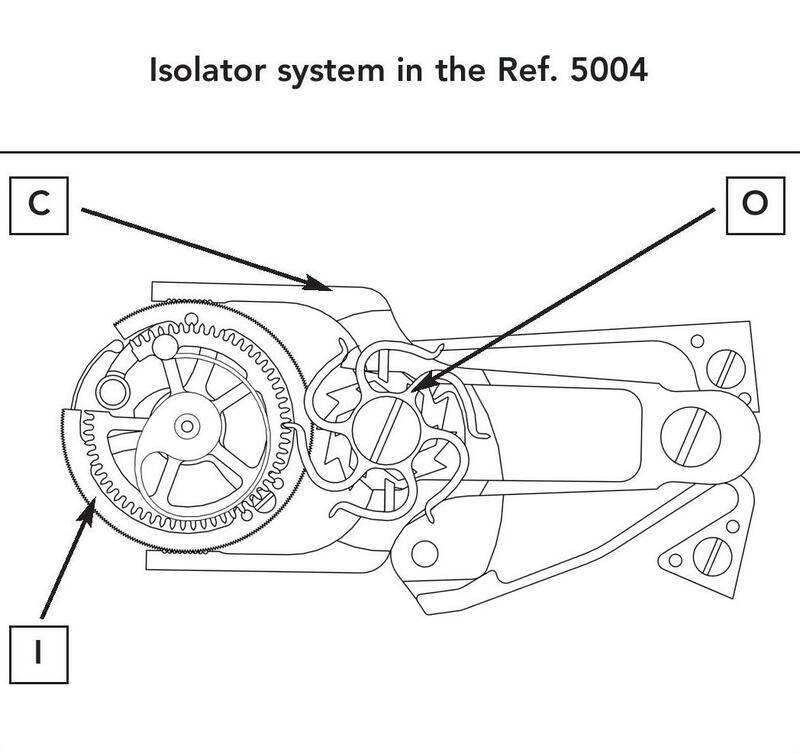 5004 in which the isolator (octopus) wheel rotates only in one direction, this isolator moves back and forth when the split-seconds clamp is opened and closed. This improves reliability. Split-seconds chronographs have two sweep hands: the chronograph hand (trotteuse) and the split-seconds (rattrapante) hand. 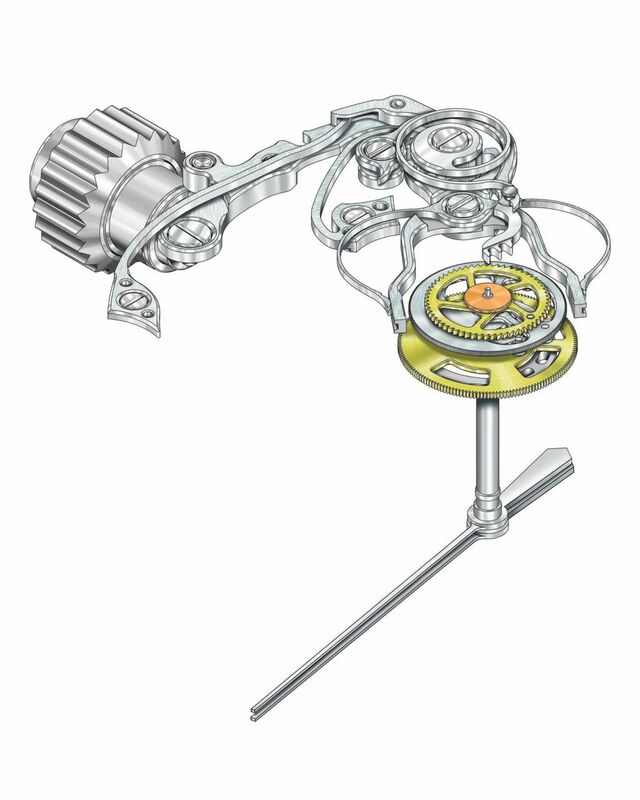 The split-seconds wheel with the split-seconds hand rotates together with the chronograph wheel to which the chronograph hand is attached; both wheels are connected with the splitseconds heart cam that is mounted on the chronograph wheel. As is the case in all mechanical connections, the ruby roller of the split-seconds lever requires a minimal amount of play to function flawlessly. However, this play can also result in slight deviations of the position of the split-seconds hand when both hands should be precisely superposed. As a rule, this is concealed by making the chronograph hand slightly wider. As such, this would not be a serious shortcoming, but then again, it is at odds with Patek Philippe’s quest for perfection. For this reason, the workshops’ caliber engineers developed an innovative solution for which a patent application has been filed. When the split-seconds hand is stopped to display a lap time, the contact between the split-seconds wheel and the split-seconds heart is interrupted because the split-seconds lever is isolated. As soon as the split-seconds hand rejoins the chronograph hand, the ruby roller (M) of the split-seconds lever (E) rolls along the contour of the split-seconds heart cam (K) until it slips into a recess that defines the congruent position of the chronograph and split-seconds hands. Because of the mechanical play and movable ruby roller, this position may vary slightly and result in minimal superposition offsets. 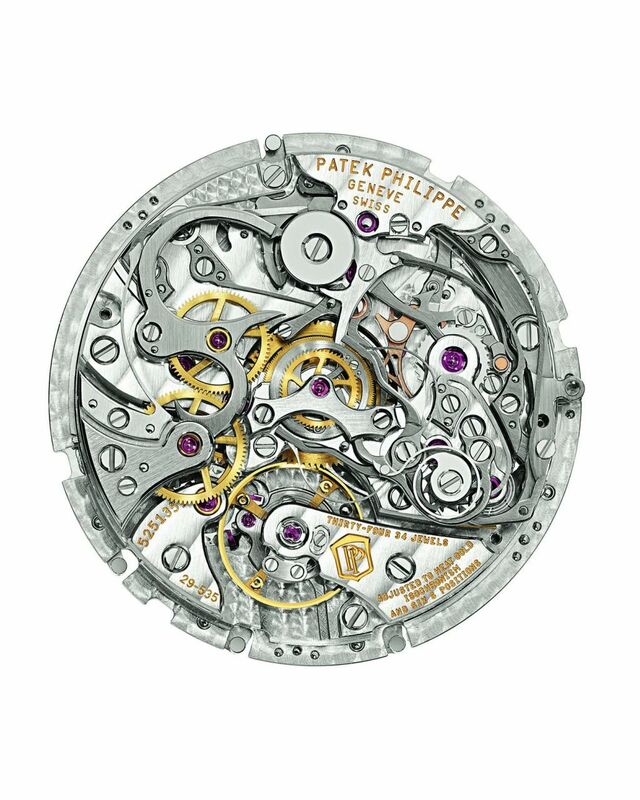 In the new Patek Philippe solution, the spring-loaded split-seconds lever has two flat contact surfaces (N) on either side of the ruby roller and the recess of the split-seconds heart cam has two flat shoulder zones. As soon as the ruby roller drops into the recess, the flat contact surfaces of the split-seconds lever come to rest against the flat shoulders of the split-seconds heart cam. For this reason, the alignment of the split-seconds hand is defined by the stable contact surfaces (N) and no longer by the movable ruby roller. This solution improves the positional congruence of the split-seconds wheel relative to the chronograph wheel by 75%. The result is the highly enhanced superposition of the split-seconds hand and the chronograph hand when the chronograph is in the start position or when the split-seconds clamp is released. The perpetual calendar mechanism of the new classic Patek Philippe split-seconds chronograph was presented in 2011 with the debut of Ref. 5270. It is composed of 182 individual parts and occupies 1.65 mm of the overall movement height of 8.70 mm. This testifies to the manufacture’s competence in dealing with complex components such as large levers, date wheels, day and month stars, leap-year cams, lever springs, and other intricate parts. In Patek Philippe timepieces, the appeal of such components lies not only in the precision with which they were crafted but also in the lavish finishing work invested in them, such as gently concaved and polished chamfers, manually satin-finished flanks, and straight-grained surfaces. The steel wheels and pinions are also meticulously finished: all teeth and leaves are individually polished by hand using a rotating hardwood disk. This work is done not just for the sake of beauty. Smoothly polished surfaces generate less friction, reduce wear, and transmit kinetic energy more efficiently. Despite the complexity of the elaborate going train, the split-seconds chronograph, and the perpetual calendar, the well-organized dial presents the twelve separate indications with exemplary clarity and legibility. 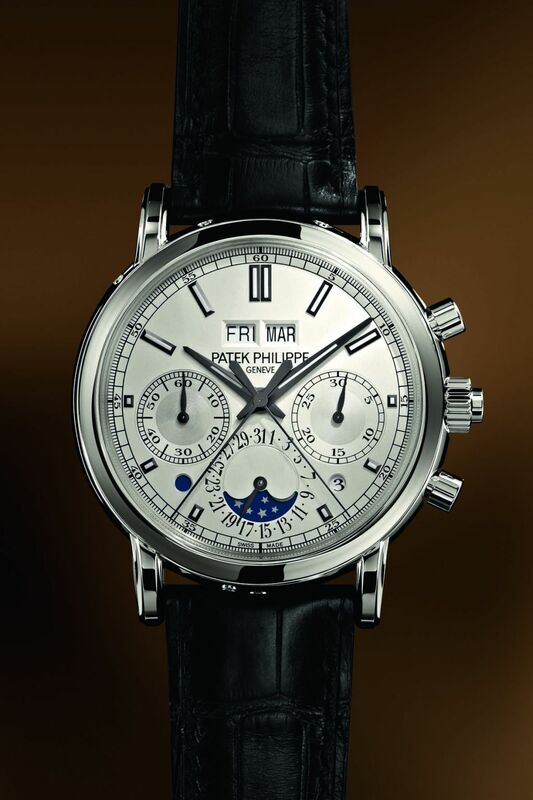 It features the typical face of classic Patek Philippe calendar chronographs as did the Ref. 5270, only this time with the addition of a split-seconds hand. True to tradition, the day of the week and the month are displayed in two in-line apertures beneath 12 o’clock. The analog date dial at 6 o’clock incorporates the moon phase display. The continuous subsidiary seconds and the jumping 30-minute chronograph counter are located at 9 and 3 o’clock, respectively, in dials whose centers are shifted slightly below the horizontal centerline of the main dial. 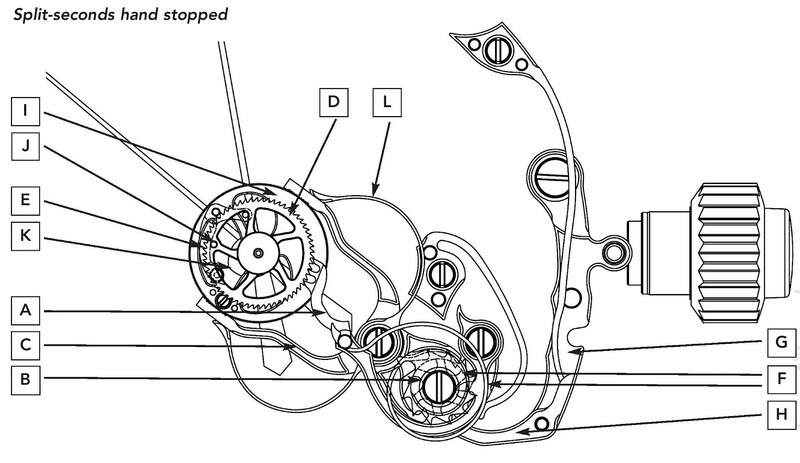 This layout is a typical design feature of the movement. The small round aperture between 4 and 5 o’clock indicates the leap-year cycle, and a second one between 7 and 8 o’clock accommodates the day/night indicator that simplifies corrections of the calendar functions. The silvery opaline dial is crafted from 18K gold; it has twelve applied baton hour markers in white gold with luminescent fillings. Together with the black-oxidized gold hour and minute hands, also with Superluminova fillings, the markers assure outstanding legibility in the dark. The intelligently configured dial sets the stage for one of the most popular and useful functions of a grand complication wristwatch. 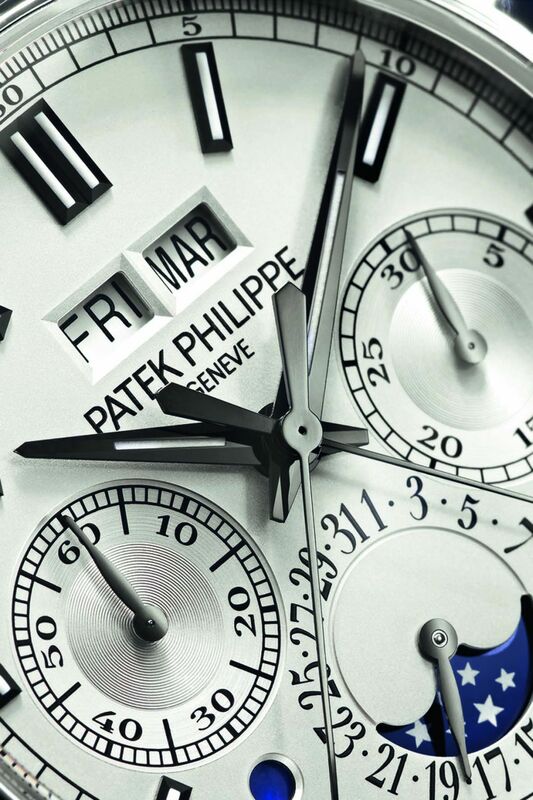 As the apotheosis of Patek Philippe’s classic chronograph trilogy, the new Ref. 5204 is housed in a platinum case with a diameter of 40 mm and a height of 14.19 mm. The sleek, round, three-part case with straight lugs has a cambered crystal secured in a concave bezel; the sapphire-crystal display back can be replaced with a solid-platinum case back that is delivered with the watch. Because it is exceptionally tough and difficult to machine, platinum always challenges the skills of casemakers, imposing considerably more stress on the tooling than other classic case materials such as gold and steel. But in return for the hard work involved, it stands out with an incomparably cool silvery gloss and a physical mass that underscores the class of this timepiece in a very palpable way. As with all of the manufacture’s platinum watches, the case is marked with a flawless Top Wesselton diamond discreetly set between the lugs at 6 o’clock, where it is noticed only by the wearer. The round start and stop pushers at 2 and 4 o’clock, and of course the pusher in the crown that controls the split-seconds hand, distinguish this model from simple chronographs with perpetual calendars. The new Ref. 5204 split-seconds chronograph with perpetual calendar is crafted with all meticulous attention to detail mandated by the directives of the Patek Philippe Seal. It is worn on a handstitched, matt black alligator strap with square scales, and secured with a very comfortable and convenient platinum fold-over clasp. Manually wound mechanical movement, split-seconds chronograph with two column wheels, chronograph and split-seconds hands, jumping 30-minute counter and subsidiary seconds. Perpetual calendar with day, month, leap-year cycle and day/night indication in apertures, analog date. Moon phases. Strap: Alligator leather with square scales, hand-stitched, matt black, fold-over clasp in platinum. The six patented innovations for Patek Philippe’s proprietary CH 29-535 PS chronograph caliber launched in 2009 are also incorporated in the new CHR 29-535 PS Q caliber of the split-seconds chronograph movement with perpetual calendar. They contribute to long-term reliability; the simpler and more precise adjustability of specific functions; more convenient servicing; greater energy efficiency, and reduced wear. These advantages safeguard the value and longevity of Patek Philippe timepieces, assuring that they will delight future generations to which they are handed down. 1. Optimized toothing profile: Suppression of hand quiver or rebound at start. Vibration-free chronograph hand movement. Increased efficiency. Reduced mechanical wear. 2. 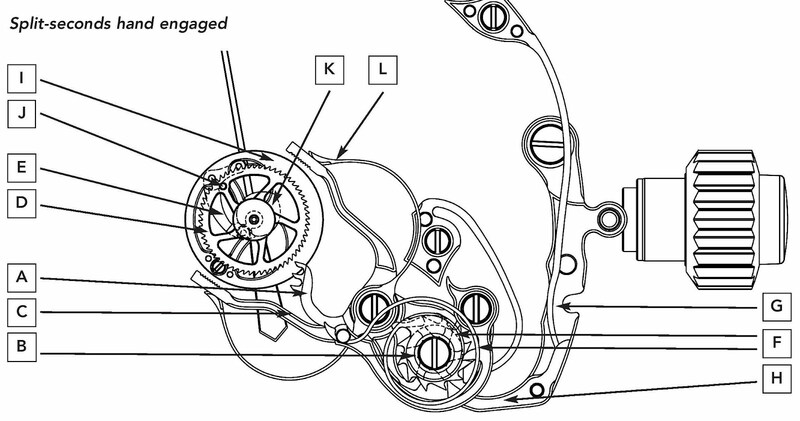 Precision adjustment of engagement depth at the column wheel: The large eccentric cap on the column wheel allows the very precise mesh depth adjustment of the chronograph wheels at the outermost end of the clutch lever. 3. 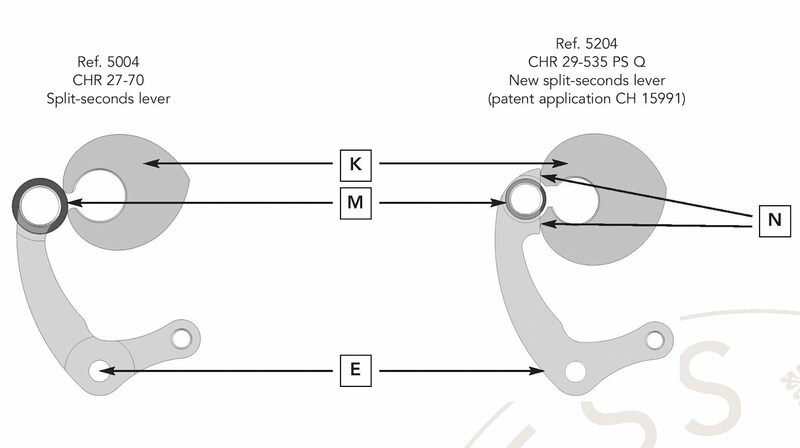 Optimized synchronization of the clutch lever and brake lever: The clutch lever and brake lever are synchronized directly with a finger at the clutch lever. This eliminates the complicated intermediate step via the column wheel. 4. Slotted minute-counter cam: Thanks to the slotted minute-counter cam, the chronograph hand can gently coast to a stop when reset. 5. Self-setting hammers: Self-setting hammers improve functional integrity and dependability. 6. Hammers pivoted between jewel bearings: The two hammers that reset the chronograph hand and the minute counter are independently pivoted between jewel bearings on the same axis; each hammer is pressed against the respective return-to-zero heart cam with its separate spring. This system optimizes the precise alignment of the hammers and improves their stability. The caliber CH 29-535 PS movement has even more reliability and performance enhancing features. In particular: the instantaneous 30-minute counter is much more complicated than a semi instantaneous or a continuous counter. Thanks to its intricate construction, the small hand jumps within fractions of a second to produce accurate, doubt-free readings. Another example relates to the chronograph’s driving wheel that is integrated directly into the going train and does not need to be retrofitted by the watchmaker.